Mile High Style Blogaversary Giveaway! 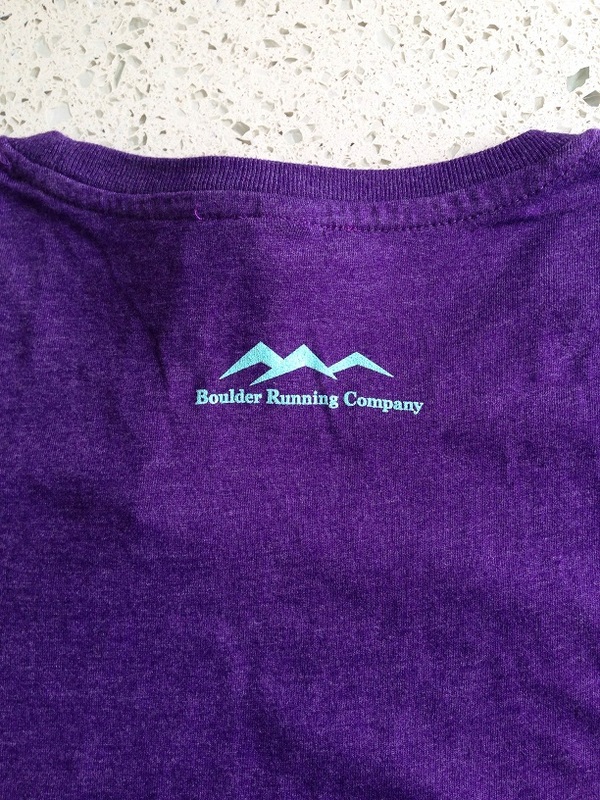 Since running is kinda a big deal where I live, I wanted to contribute something from my hometown of Boulder, CO to our blogaversary celebration. 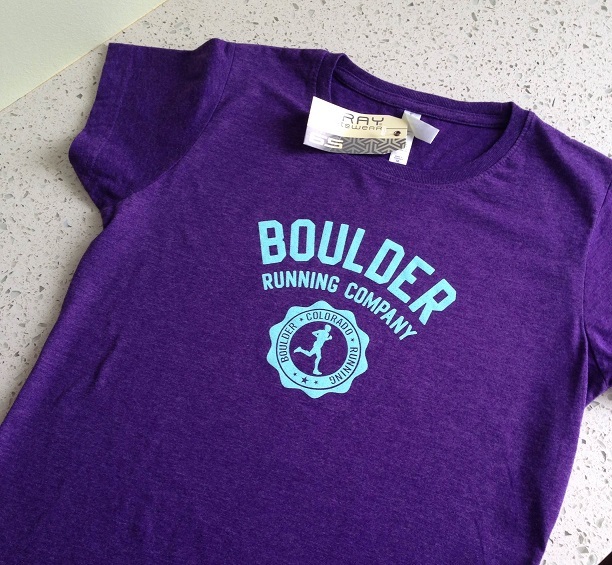 Without a second thought, I headed straight to the Boulder Running Company store. I fell in love with this t-shirt because it has my two favorite colors, purple and turquoise. Plus, it’s just stylin’. And soft. And comfy feeling. And cute. So there. Don’t lose faith that spring is coming! Then, imagine my glee when I spotted the cute Sanuk sandals all lined up and on display for spring. Remember spring? It’s coming, y’all, don’t lose hope. If you’ve never heard of Sanuk, you need to know that their slogan is “Smile – Pass It On” (because yessssss), and that they make their shoes from recycled yoga mats. Yes, YOGA MATS. In my head, that automatically equates to foamy foot pillows, which they really are. I have a pair of these flip-flops, and I adore them. I wear them everywhere in the summer, especially after races. 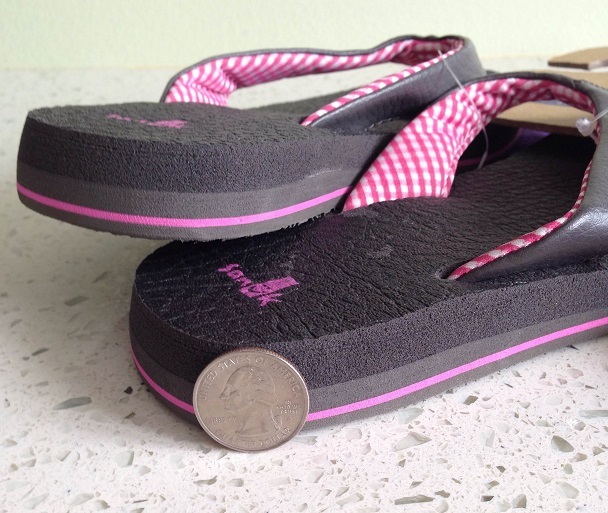 They are super thick and cushy for flip-flops and ultra durable, too; I’ve had my pair for 3 years. The pair in the giveaway are an elephant grey synthetic leather with dark pink accents in size 7. As thick as a quarter, heaven for your tired feet! I thought these two lovely items were so fantastic that one lucky reader needed to get in on this action. And although Boulder is sometimes touted for its complete lack of fashion sense, i.e. undying devotion to dreadlocks and serapes, if you win this giveaway rest assured that a serape is NOT included. Promise. You will, however, be cute as a button and oh sooooo comfortable. Best of luck, everyone! Check in tomorrow for our final Blogaversary giveaway announcement from Kyle because it. Will. Be. Awesome. And ice cream. That is all. This post is not sponsored by the Boulder Running Company or Sanuk. Shirt is valued at $27.95 and has already been purchased in a size medium. Sandals are valued at 29.95 and have already been purchased in ladies size 7. Winner must supply mailing address directly to Scoot a Doot blog in order to receive the prizes. May the odds be ever in your favor! 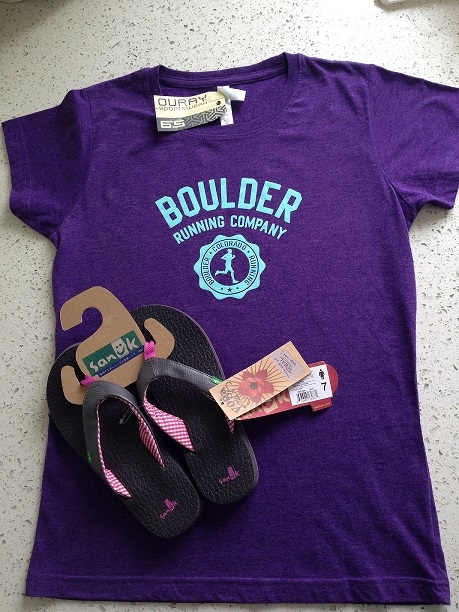 This entry was posted in Giveaways and tagged Boulder Running Company, giveaway, healthy living, running, sandals, Saunk, shirt, Smile. Bookmark the permalink. They so are. You’ll love them! Best of luck! The purple shirt is awesome! When we lived in Parker, we used to like to head to Boulder to do some shopping. Miss it! Such a great town and such a great state! I know Parker well!! Hopefully you’ll win and have a little love from CO in your mailbox! Good luck, Megan! That shirt looks super comfy! It feels like it would be! Hope you win it!! My two favorite colors on that shirt – so awesome! And, really, you can never have too many flip flops. Even if they are a size too big. I’ll make it work. Those are the best colors on the world, aren’t they?! Best of luck in the drawing! Love that the shirt is purple! Best color ever! Thanks for stopping by! There is soooo much to explore; the trail system can’t be beat! Good luck in the drawing, Amanda! 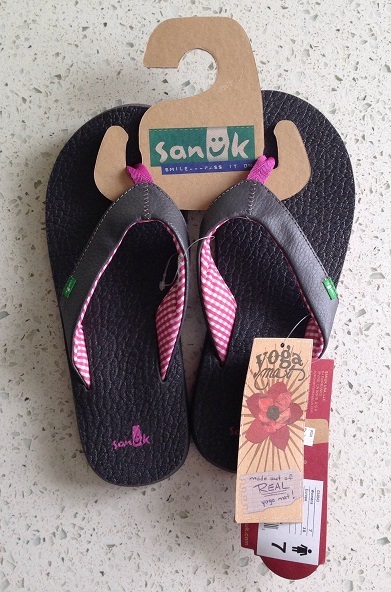 Love Sanuk….didn’t know they made flip flops. Best. Flip flops. Ever! Good luck! I love the shirt! The sandals look comfy also! Yay! Thanks for checking the giveaway out, Beth! Good luck! You are so welcome! Best of luck to you! I know, April, I KNOW. It’s brilliant, really. Your feet will be equally surprised! Good luck to you! I went to school in Boulder a bazillion years ago– never actually *ran* while I was there (hills 😉 ). And those shoes look SO comfy!! So many BIG hills. I have yet to brave many of them myself. And the shoes are to die for comfy! Good luck to you! Shirt looks great!! The sandals look comfy also! Thanks, Lindsay! I couldn’t resist those colors. Best wishes in the giveaway! Love the Sanucks especially since they are PINK!!! Pink, purple, and turquoise, what more does a girl need? Oh, right…running shoes! 😉 And these Sanuks, of course. Best of luck to you, Amanda! I’ve heard absolutely amazing things about Sanuk sandals! <3!! Thanks so much for having this giveaway! I have tried those sandals before, but never bought them. I think if I had a pair, I would never take them off. The sandals look very comfortable. Thanks for the giveaway! That’s a really cute shirt! Sandals look comfy too. love the shirt and sandals! I think it’s destiny that I wear a size 7 haha. Those sandals are so cute and casual, they look so comfy! Thanks for the giveaway!